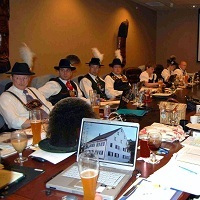 Every two years, in the “even” years, Gauverband Nordamerika holds its meeting of the member Vereine. 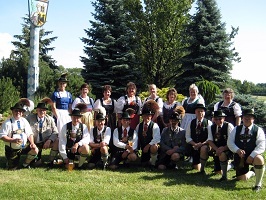 The meeting is held the weekend containing the first Sunday in May and is hosted by a Verein from the Gauverband at a site selected at the previous Delegates Meeting (unless approved otherwise by the delegates). It is attended by up to two delegates plus alternates and observers from Vereine throughout the Gauverband. The weekend consists of a meeting of the Ausschuss (Executive Board) on Friday, general sessions for all delegates on Saturday and Sunday, an administrative session, and a Vorplattler meeting. Workshops are conducted on cultural subjects, and a dance workshop is held on Saturday night. 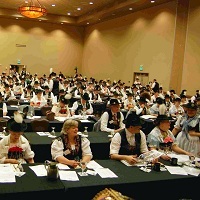 On Sunday, the delegates vote on site selection for the next Delegates Meeting and the Gaufest that is three years away. Election of Gauverband officers (Ausschuss) is also conducted. About 200 people (delegates, alternates, and observers) attend the meeting. The meeting minutes for the last five meetings are shown below, and they include the minutes of the Friday Ausschuss meeting, minutes from the General, Administrative, and Vorplattler meetings, and all the committee, officer, and workshop reports presented at the meeting.